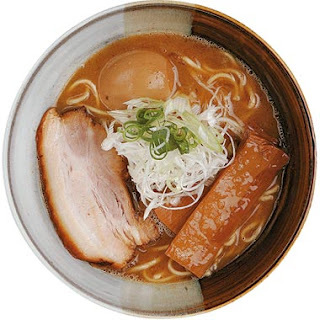 Having eaten my way through the vast majority of the ramen shops east of Meiji-dori, I felt ready to venture across the street to see what the zone just east of the Takadanobaba station had to offer. It was raining, and I was tired and not so hungry, but I still needed dinner, so I decided to go for a ramen a bit on the lighter side. Watanabe was close by, and I heard they had a wafû (Japanese style) soup, which sounded good, since I was in no mood for something oily after having had a huge mochi and cheese sandwich for lunch. Watanabe was apparently opened by the young and dashing "ramen producer and consultant" Watanabe Juan, a mere 33 years old. I'm not really sure what "ramen producer" means, or how one becomes one at the age of 33, but Watanabe was clearly going to be a very modern, chic, "new style" trendy ramen shop. 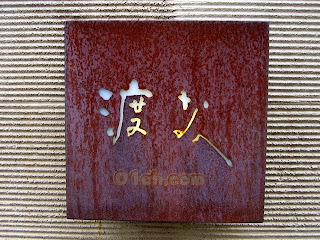 I walked right by the store once, not realizing that the totally plain stone decor and backlit sign could hold a ramen shop - it seemed much more "fine dining." Inside, the textured stone walls continued for a very classy, minimalist "design concept." There were less than 10 seats and only one very young, very fashionable young cook manning the pots. I ordered the plain ramen, no pork and sat down to wait. Everyone else who entered and left the shop during the course of my bowl were young couples - this was definitely a "date restaurant." The soup was a thick dark brown, very kotteri, and very, very fishy. I had caught a whif of the boiling fish broth when I walked in, and knew what I was in for, but this was the fishiest soup yet, with small brown flecks of the dried fish used for the stock clinging to the noodles. The noodles themselves were medium-thick, very straight, and a bit darker in color than the average noodle. The menma were, simply put, huge, just two or three slabs almost half the size of a dollar bill and thick as hell, almost to the point where they were difficult to eat. It was clear that everything going into Watanabe's ramen bowl was of extremely high quality, but I just couldn't really enjoy it. It was tasty enough, but the fish taste was, at least for me, overpowering. It seems that blended niboshi is definitely "in" among the trendy new ramen shops, but it's just not my personal taste. Eating at Watanabe was like listening to Eric Clapton - I recognize that it is masterfully conceptualized and executed, but I just can't get down with it. I'm sure Watanabe will continue to do good business with well-dressed young men and their health conscious girlfriends, but it's not the ramen for me.